Two free response questions on direct current circuits were posted on 5th March 2008 for your practice. As promised, I give below the answers along with the questions. 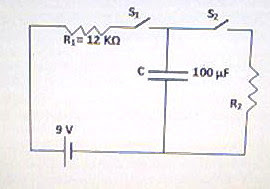 A 10 V battery of negligible internal resistance is connected in series with a 4 Ω resistor R1, a 6 Ω resistor R2 and a 2 µF capacitor C as shown in the figure. A series combination of a 6 Ω resistor R3 and a switch S is connected across the series combination of R2 and C. The switch S is initially open and the battery has been connected for a long time. (a) Determine the voltage across the capacitor C and the magnitude of the charge on one of its plates. (b) The switch S is now closed. Determine the voltage across the capacitor C immediately after closing the switch S.
(c) Calculate the voltage across the capacitor C a long time after closing the switch S.
(d) Calculate the energy stored in the capacitor C a long time after closing the switch S.
(a) Voltage across the capacitor is the same as the battery emf 10 V since the capacitor will charge through the resistors R1 and R2 to the full applied voltage on connecting it to the source for a long time. (b) Immediately after closing the switch, the voltage across the capacitor is 10 volts it self since the capacitor cannot discharge immediately through R2 and R3. (c) When the switch S is closed, the capacitor starts discharging through R2 and R3. After a long time, the voltage across the capacitor becomes equal to the voltage across R3. Voltage across R3 = (Current through R3)×R3 = [10/(6+4)]×6 = 6 V.
(d) The energy stored in the capacitor = ½ CV2 = ½ ×(2×10–6)×62 = 36×10–6 coulomb = 36 μC. (e) The energy will decrease since the voltage across the capacitor decreases from 10 V to 6 V.
In the adjoining figure the capacitor C is initially uncharged and the switches S1 and S2 are open. The battery has negligible internal resistance. (a) The switches S1 and S2 are closed simultaneously. What will be the voltage across the resistor R2 immediately after closing the switches S1 and S2? Justify your answer. (b) Determine the current through the resistor R2 immediately after closing the switches S1 and S2. (c) A long time after closing the switches S1 and S2, the voltage across the resistor R1 was found to be 6 V. Calculate the value of the resistor R2. (d) After a long time the switch S1 is opened but the switch S2 is retained in the closed condition. Calculate the voltage across the resistor R2 at the instant when 0.6 seconds have been elapsed after opening switch S1. (a) The capacitor draws the maximum charging current initially and therefore effectively places a short circuit across the resistor R2 and the entire supply voltage of 9 volts appears across R1. [This is the same as saying that the initial potential difference of zero volt across the capacitor cannot change abruptly since it takes time for the charges to get accumulated on the plates of the capacitor and to increase the P.D. across the plates]. (b) Since the initial voltage across the resistor R1 is 9 volts, the initial current through it (immediately after closing the switches S1 and S2) is 9 V/12 KΩ = 0.75 mA. (c) The current flowing through R1 = 6V/12 KΩ = 0,5 mA. 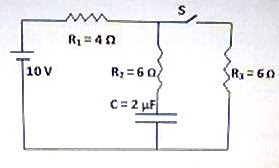 The voltage across R2 = 9 V – 6 V = 3 V.
R2 = 3 V/0.5 mA = 6 KΩ. V = (Q0/C) e–t/RC = V0 e–t/RC where V0 is the initial voltage which is 3 volts. V = 3×e–0.6/0.6, since RC = R2C = 6000 Ω × 100×10–6 F = 0.6 second.